Urafirth Primary School is a two teacher primary school in Northmavine, Shetland. 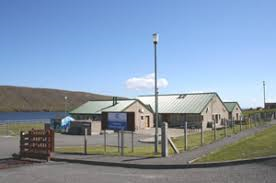 The school sits in a picturesque location on the seashore, with views of Ronas Hill, Shetland’s highest peak. It is positioned midway between the villages of Urafirth and Hillswick, with the school catchment area stretching from Eshaness to Hamar and Heylor. The school has a nursery class, operating extended hours (8am – 4pm), which serves the whole of the Northmavine area.